The chair is a "project in the process". It is so comfortable. I got it for $5 at a yard sale. I've recovered it in beautiful drop cloth, but that is all so far. I plan to paint the woodwork white and add some graphics to the fabric. The two cushions I covered myself. One is a burgundy red flower design, and the other is a print onto calico fabric directly through the printer, then sewed on to a drop cloth cover. You can see the full tutorial for this cushion cover by clicking here. My gorgeous white antique writing desk fit perfectly under my teal shutters. The writing desk was also a redo. You can click here to see the full make over tutorial. I'm really pleased with the wall art in this area which has mostly been bare since we moved in. 5. Framed Old Clock Keys. The gorgeous flowers were a special treat for myself yesterday from Blushing Blooms Florist. They are a mix of some of my favourite flowers - snapdragons, roses and lilies. I can't wait till they are in full bloom and smelling divine! And they fit perfectly in my new cosy corner. P.S. Yes, I made the numbered drop cloth cushions on the lounge too. You can view the tutorial here. Your cosy corner looks simply gorgeous! That is a lovely corner! That desk is gorgeous. You've created a very inviting little spot. I love your desk and all the other personalized details! you must just love it!! What a pretty little corner. I LOVE YOUR COLORS!! Stopping by from Type A. Love your cozy corner.The colors are so pretty.Love that desk. Love the corner, its really cute!! :) Have a great weekend! Very sweet little corner. I especially love the book wreath hung on the shutters! Hi Julie! Love your cozy corner!! The teal blue shutters are gorgeous! Thanks for sharing all your tutorials here - you are a very talented DIY'er! Just found your blog - so gald I did! Am following you now. Please visit my blog and say hello sometime! I love to make new bloggy friends :) Follow me back if you would like! Have a wonderful weekend! Everything looks great--really love the teal shutters. How wonderful to have a new little area in your house so beautifully decorated! Hi Julie! 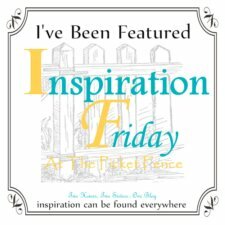 We wanted to let you know we love your cozy corner and we will be sharing it this week at Inspiration Friday! Thank you so much for linking it up.